These are SO easy to make, and the most refreshing lunch ever. They'd also be a great dinner if you want something lighter. Personally, I've been eating even more raw food than usual lately, just because that is what my body is telling me. I think listening to your body is the best decision when it comes to diet and exercise... and sleep for that matter. Get in tune with YOSELF and you'll feel a lot better. A special ingredient in these are the tortillas. They are from a company called Raw Wraps (go figure) and they are amazing! 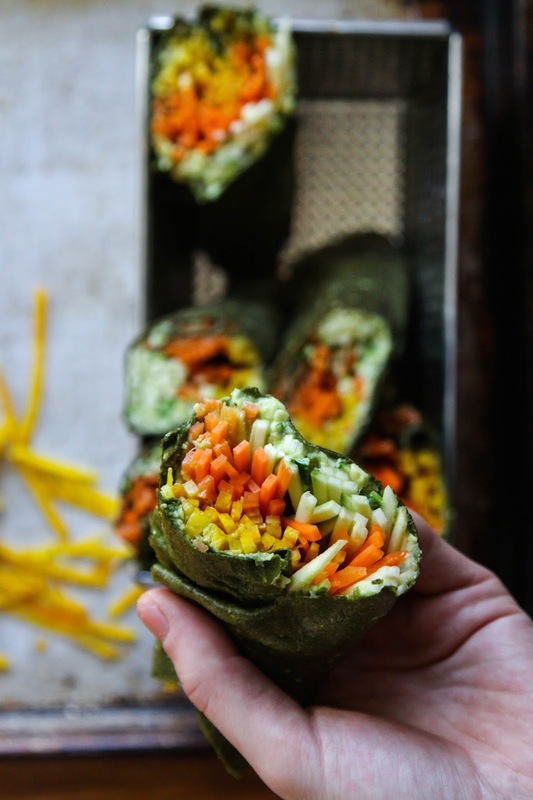 Basically just made from greens (kale or spinach) and apples and quinoa, they taste delicious and are a super effortless way to get in your dark leafy greens for the day, in burrito format. I've made this recipe several times now because it's so simple and nutritious. Besides, the colours are down right joyous. Pretty colours keep me comin' back. Jack vouches for them too, he ate more than me! I don't even need to add salt or any other flavourings or oils. 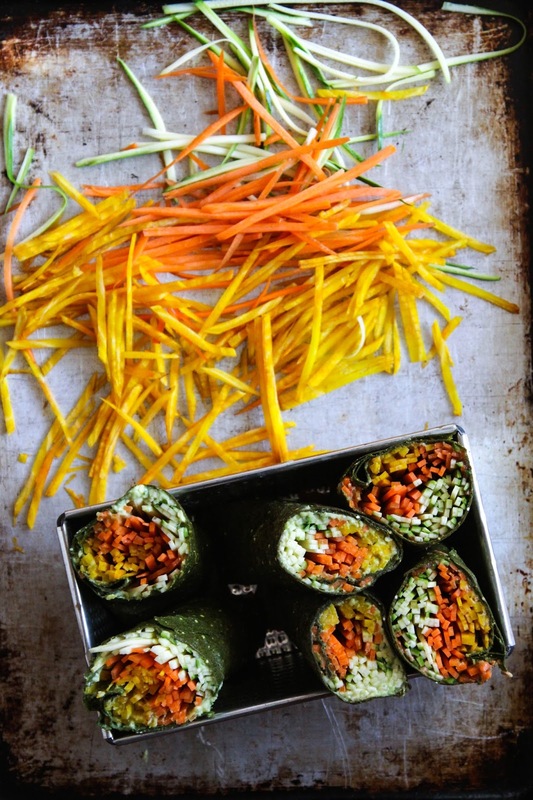 The wraps plus avocado, lemon, carrot, zucchini and golden beet are enough on their own. Having said that, my palette for raw food has evolved over the years and I have grown to love the taste of really simple food. I can understand if most people still like some other seasonings so if you want to add salt, pepper, chili, hummus, hot sauce or whatever else you like - go for it. I sliced the veggies on a mandoline, which I highly recommend. You can use a cheese grater (inexpensive) or spiralizer (quick and easy) but the mandolin (still pretty quick and easy, with more options) is my fave for aesthetics. I love my spiralizer but the curly noodles are a little obnoxious-looking, so when I know I'm going to photograph a recipe, I get out the mandoline. I have a stainless steel, French-made one from Lee Valley and it's terrific. With ease I can slice out whatever size strips/noodles I want: thick, thin, wide, narrow, long, short. It's easy to clean and as long as you're watching yourself, quick to use. Just be careful with your fingers! Mandolines have very sharp blades (duh). 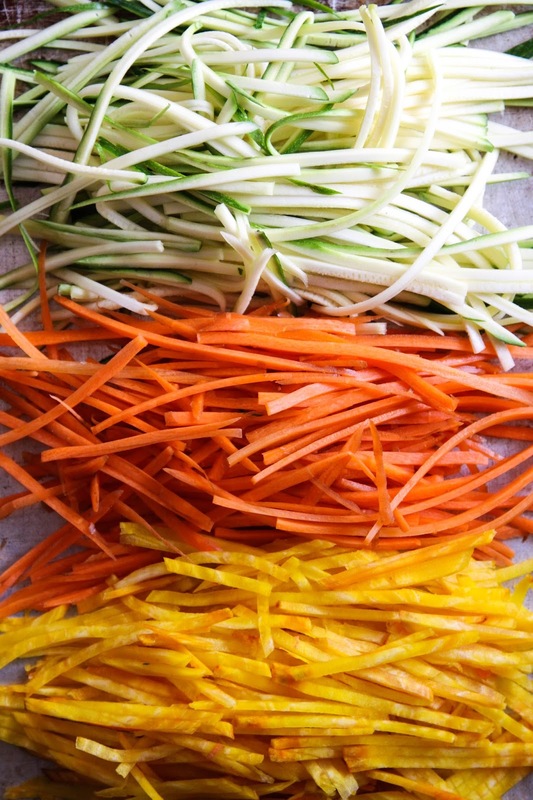 Slice the carrot, beet and zucchini into thin strips on a mandolin, cheese grater or spiralizer. Set aside. Mash the avocado meat up with lemon juice until you get a pretty smooth mixture. Spread this onto all your wraps. Then place in the thinly sliced veggies and wrap up tightly but carefully. Let them fir for 5 minutes, then cut in half with a sharp knife and enjoy! This would probably be terrific with tahini or peanut sauce. 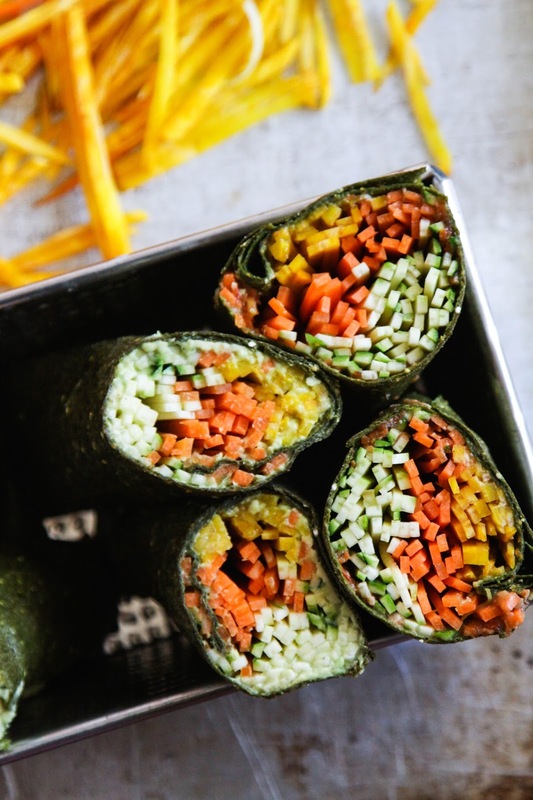 These wraps look fabulous! I am always on the hunt for a GF wrap that doesn't crack and break when it's rolled. Do you order them online or is there a local retailer in Vancouver that stocks them? wow! this recipe looks amazing! as well as the raw wraps, i will have to order some myself. 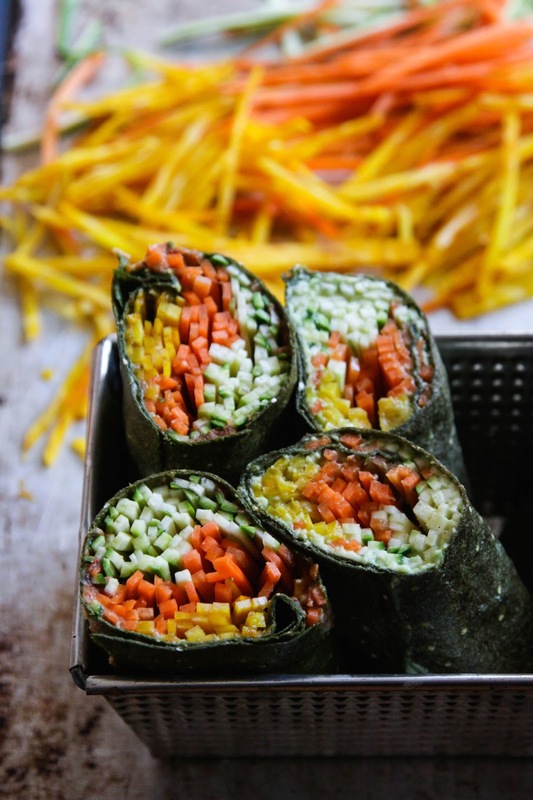 do you think this recipe wold work with raw nori seaweed as the base instead? Thank you for this delicious recipe of RAWSOME WRAPS, it really looks so enticing that i can’t really take my eyes off of it. This is an incredible recipe and honestly, i never thought preparing veggies could be this flavorful and playful. This is perfect as side dish for dinner and the ingredients are not expensive, simple yet it is overloaded with flavors. It reminds me of the several vegetarian dshes i really loved at Steersons Steakhouse (http://www.steersons.com.au/) and it really looks as great as this. I can’t wait to try this one out. Colors are good for the heart. These look so delicious!! I think it would be great with nori too! 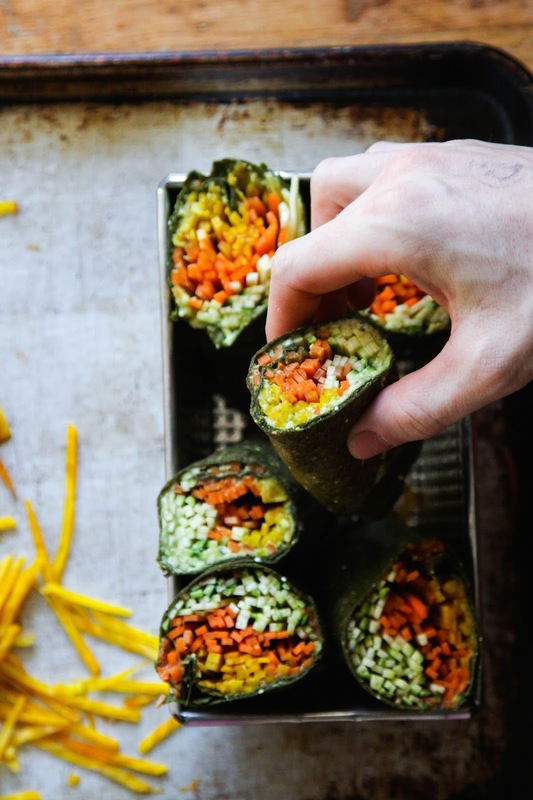 anybody knows where to find spinach wraps in Italy or online store for Europe in general? I just checked out their site and I love that they appear to not crack when rolled. I have had such messy lunches over this! These colors do look great. My first thought, when I saw the wraps was that they would go great with a peanut dressing. I will give these wraps a try next week. such vibrant colors! just ordered the kale wraps online. emily. thanks for this recipe. I just made these for dinner using nori to wrap them in, capsicum instead of beets and I mixed a bit of fresh chili in with the avocado. They were so delicious! I'll definitely be making them again, thanks for the yummy recipe. Now for dessert - banana and carob soft serve here I come! perfect, love simple and healthy food! Wasn't sure how this would have flavor, but I put everything together as directed and sure enough this was AMAZING. It is now on our weekly meal plan. Thank you!